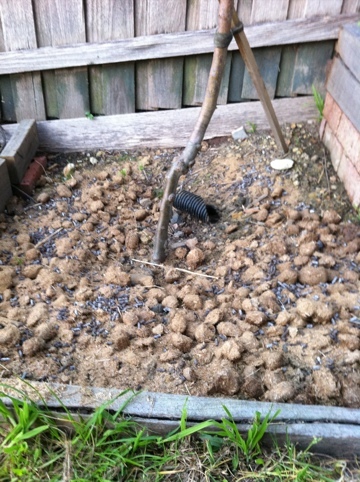 Premulch - Put down a good dose of manure (preferably more rotted than this!) and some fertiliser. Winter is the time to be putting down mulch in your garden. As I mentioned in my previous post about mulching the vegetable garden, mulching – covering the soil with a protective layer- is an important task. In the fruit and vegetable garden mulch should preferably be some sort of organic matter, because then it will add to the health of the soil. However in an ornamental garden non-organic mulches such as pebbles may be appropriate. 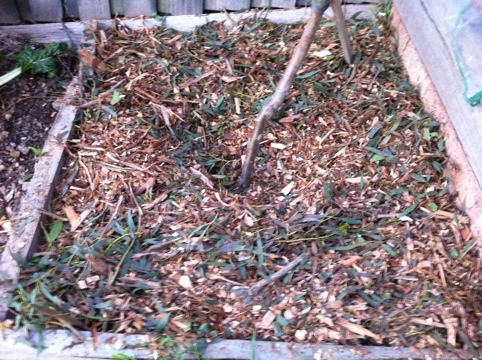 As you can see from the photos below, the mulch I selected was fairly newly shredded tree material. This will work fine and provide a good protective layer against weeds, but because it is quite new it will draw nitrogen from the soil as it breaks down. This obviously isn’t a good thing for plants as it reduces the amount of nitrogen they have for growth. To offset this I would recommend applying a good dose of fertiliser to the surface of the soil like blood and bone and/or rooster poo. Mulch offers many important benefits to the gardener. The first of which is it helps keep the weeds down. Apart from looking unsightly, weeds compete with your plants from nutrients, limiting their growth. 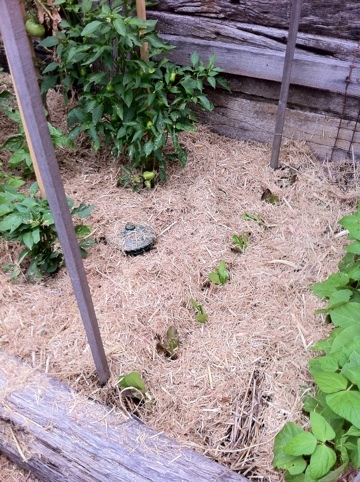 Cover with a good layer of mulch (3-5 inches). Keep it away from the plant trunk. more quickly than covered soil, leaving your plants prone to heat shock. A good layer of mulch will trap the moisture in the soil, just where your plants need it. Thirdly, keeping the soil moist helps with the microflora of the soil. Good healthy soil has fungi and bacteria that live within it. These help release nutrients in the soil and can help reduce the growth of harmful organisms. When the soil heats up and dries out, this sterilises the soil, reducing the number of microflora in turn reducing soil fertility. Mulching will help prevent this. Firstly start by removing any weeds and grasses around your plants. This will stop them simply growing through the mulch you apply. Like I said above the next step is to put a layer of fertiliser down to provide some available nitrogen. Also it is easier to apply fertiliser for your plants before you put down the mulch. Lastly finish by applying a good layer of the mulch, between 3-5 inches. This depth will really help to keep the weeds down and build a good soil microclimate. Just be sure to keep the mulch away from the trunks of your trees. If it is too close it can cause collar rot of the trunk, killing the tree. So, do you use mulch in your garden? If so, what types? Have you found it helped? Let me know with a comment below. Thanks!